Here we come again with Schwinn’s product but in different type or series. Like usual, we will make a review of them to help you see the differences between the two and to get compared side by side in full. We hope it will help you see it clearer and find the best option for yours soon. There are a lot of similarities but there are also differences which are same important things to discuss. That is why the title of this page will be in form of verses; Schwinn 130 vs Schwinn 170. Check the reviews out! Schwinn 130 is a bike with all good features and aims to provide a comfortable and convenient workout although the features are not too many. You will some accessories like a magnetic resistance, belt drive, flywheel, workout programs and the ability to upload your workouts to the Schwinn Fitness Account and myfitnesspal.com. And Schwinn 170 offers great features with great price too. To make it worth enough to buy, Schwinn 170 comes with a good range of accessories such as a water bottle holder, speakers, fan, media shelf, a charger for media devices and a fitness account you can upload to using a USB stick. The Scwinn 130 has one piece crank and 170 has 3 piece crank. They aim to make stronger ad more durable. While the programs on Schwinn 130 are only 9, Schwinn 170 adds 3 more programs. It has one more program in each of the categories of fun rides, challenges and mountains. Forearm rests for Schwinn 170 also better with elbow pads on it to provide more comfort for when you want to lean forward on to the handlebars. The Schwinn 130 just give you the option to move it vertically, but in Schwinn 170, you will have the ability to move the seat vertically and horizontally. What about the weight? The 130 is about 4 lbs lighter than the 170 due in part to the extra seat adjustment. And other main differences come from the pedal size, and of course Schwinn 170 has bigger pedal than 130. 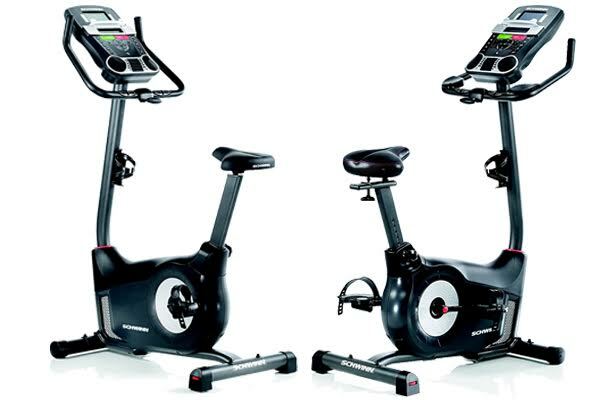 Both Schwinn 130 or 170 are well designed by the company and got some good reviews on each customers. But, it seems like Scwinn 170 will get you more especially if you are in heart rate control programs. You can monitor your data although there is someone else who use the same bike. The size of Schwinn 170 is also a beneficial for feet with size 10 or over to avoid bang your ankles or heals on the crank arm. Choose the Schwinn 130 only if you have not enough money to purchase one Schwinn 170.